Regardless of all the different decking materials that are launched on the market, wood decks have an eternal charm that is difficult to beat. Anyone who wants to create a style statement in the designing of their home prefers to use decking made of wood. 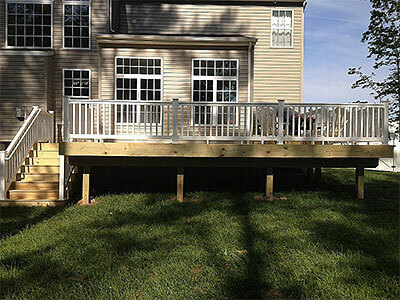 Fence & Deck Connection has hundreds of customers in Annapolis who have asked us to install wooden decks on their property while we also get a number of requests for additions and upgrades from numerous customers in Crofton, Odenton and South Gate. Even if wood planks are from a single lot each will have a distinctive look, color and grain and this is what adds character to wood decking. There are different wood species you can choose from for your wooden deck and hardwoods are generally much more long-lasting than softwoods. The latter require very frequent re-sanding & re-sealing. On the other hand, hardwoods are more expensive then softwoods like pine, but its lower maintenance and durability make up for the extra cost. Adding wood decking to your home is the best way of expanding the usable outdoor space in your home. In addition to this, the decking can also be used on property that has slopes and grading. Hardwood decking is strong and highly-durable but you will have to pay some attention to it in terms of regular maintenance. Over time, and with exposure to harsh climate, it might fade, splinter or crack. In addition, excessive moisture in the air and exposure to UV rays from the sun can cause a certain amount of deterioration in wood decking. A majority of hardwoods are insect-resistant and timber pressing or sealing is not required to ensure longevity. On the other hand softwoods like pine will have to be treated appropriately. 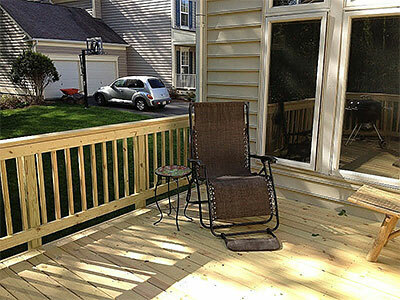 When you call us for installation of wood decking we visit your home and survey the area thoroughly. We then provide you a detailed plan based on your ideas and liking and then carry out the installation with the highest levels of efficiency and expertise. We give you expert suggestions about the kind of wood that should be used and the accessories that can be used to enhance the look of the wood decking. We can add balusters made of glass, metal or wood and also add decorative posts and sleeves. The appropriate lighting will also make your wooden decking look outstanding and unique. All our personnel are highly-skilled and courteous and your project will be completed in the least possible time and well within the agreed-upon budget. Contact Fence & Deck Connection at 8057 Veterans Hwy, Annapolis, MD 21108 for a free estimate.